> Pioneer audio giveaway & December deals. 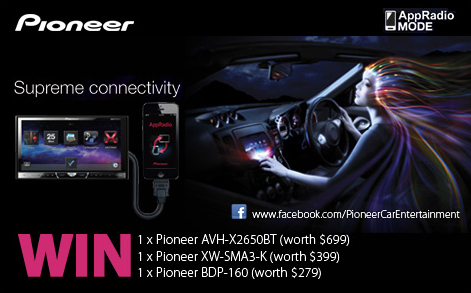 Pioneer Contest Giveaway – Car & Home Entertainment Products worth up to $1,377 to be won! Take part in sgCarMart's monthly contest by answering questions about Pioneer's revolutionary AppRadio software in the month of December, and stand a chance to win Pioneer Products worth up to $1,377. Quote SGCARMART PROMOTION to these retailers below. 1) COOL N LiTE® automotive solar films are designed and developed for maximum performance and durability. 20% off on all packages! As low as $300! Promotion period from 15th Nov 2013 to 31st Dec 2013! 2) Instant coverage online for Comprehensive or Third Party insurance plans. Aimed at drivers who are considered 'high risk' by other insurers. 'Drive Less = Pay Less' if you drive under 8,000km a year. Ideal for OPC - first time in SG! 3) E-Power System: Celebrating 11th anniversary special with 50% free upgrade! Free trial. Money back guarantee! 4) Restores and enhances the air-con performance of your vehicle. Kills 99.9% of bacteria. Cost & time economical. Tested & proven. Door step service. No hidden cost and packages. 5) Islandwide drive home service at only $38. Here at Send U Home, we strive to provide first class experience of being chauffeur-driven of our valuable clients with their personal automobile after a night out at the clubs. 6) Sing Wang Motor & Credit provides excellent professional customer services building our success establishing and maintaining long-standing reputation for selling quality cars and excellent services. Good Deals ! ! ! Didn't know sgCarMart has so many good deals every month. . .